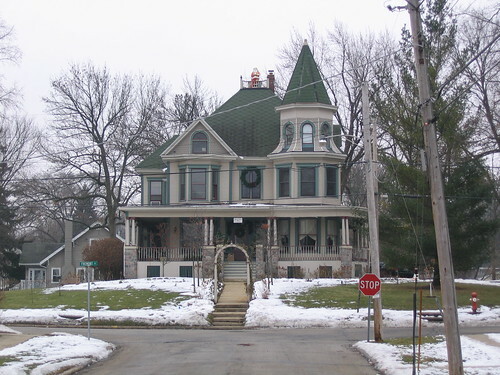 The above picture (which I took in December 2005 when we visited Woodstock) is that of a 114-year-old Victorian-style house that was depicted in the movie as the bed and breakfast where Phil Connors keeps waking up at 6:00am on the same day, over and over again. In its long history this house was never actually used for guests, but the house was recently purchased by Everton Martin and he’s planning to turn it into a real bed and breakfast! How cool is that? Everton Martin and Karla Stewart Martin bought the old home in Woodstock after searching for two years for a place that would fulfill their dream of owning a bed and breakfast. Initially unaware of the landmark’s celebrity status, the couple hopes to give the three-story house a new lease on life thanks to a $500,000 renovation. Because of its history as the movie set for Groundhog Day, the city of Woodstock celebrates Groundhog Days every year. This year’s events will start on January 25th (see the schedule of events), with woodcarving demonstrations, a chili cook-off, dinner/dance and auction, a walking tour of filming sites, breakfast and Woodstock Willie’s prognostication on February 2nd. I hope we can do the walking tour this year and make it to the Groundhog Day Prognostication on February 2nd. This entry was posted on Wednesday, January 7th, 2009 at 1:23 am CET and is filed under Illinois, Movies	with tags . You can follow any responses to this entry through the RSS 2.0 feed. You can leave a response, or trackback from your own site. What street is this house on, if we visit Woodstock?